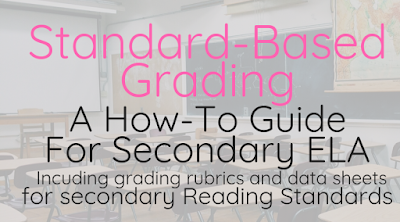 One thing that people ask me a lot is, "do you do standard-based grading in your classroom?" The short answer is yes, I do. In many elementary schools, students are graded based on the standards. In fact, in the district where I teach, elementary school students don't receive letter grades, instead they receive a standard-based grade based on the scales of the Marzano Taxonomy. So a student might receive a grade of 2.5 in science, indicating that they were just shy of mastery. Mastery of any standard is level 3. If you are not familiar with Marzano's scales and standard-based grading, then I whole-heartedly recommend that you get your hands on his book Formative Assessment & Standard-Based Grading for a thorough explanation of how to use scales, rubrics, and assessments effectively in your classroom. To give you a crash-course - basically the scales are a 4-point system for deciding what skills students need to master any standard. Level 3 is considered the "mastery" level, level 4 is an extension of knowledge utilization (note that this does NOT mean that a student is working "above grade level"), level 2 includes all of the foundational skills that one would need in order to master the standard, and level 1 indicates that a student needs a lot of help with foundational skills before they can begin to master the standard. Level 0 is not generally used, however, as we all know, sometimes students sit and produce nothing, so a 0 can be appropriate. At level 2, students would be working on learning how to independently navigate foundational-level skills like academic vocabulary, and basic recall and identification of key information. A really great way for students to work on this is to use Cornell Notetaking. This is my personal favorite, and if you are new to the blog - you can read allll about using Cornell Notes in ELA AND purchase a set of standard-based Cornell Notes for all secondary ELA standards by clicking here. At level 3, students are showing mastery of the standard. They are analyzing the text and producing some kind of product that shows that they can 100% do what the standard prescribes independently. That part is important. They must be working independently in order to show mastery! At level 4, students are extending their learning by revising, evaluating other examples or arguments, or creating an original product that shows that not only have they mastered that standard, but they can practically apply it in other scenarios. There are so many ways that you can have students show mastery of standards - formative assessment, projects, summative assessment, oral presentations... but how on earth do you grade them based on the standards? This is especially difficult when you are working with a 10-point grading system. Because of this, it is imperative that you use rubrics to assess your students. Rubrics are the #1 most effective way to ensure that students know what is expected of them, and to assess their level of understanding of standards. In order to accomplish this, I created rubrics for each of the Secondary Reading CCS standards. This helps me to decide where students are at on the scale, what skills they still need to obtain and practice in order to achieve mastery, and how exactly I can target-teach in small groups. As you can see, this is broken into a 4-point scale, and to make it even more specific, I included half-point milestones. When grading student work, you can use this rubric to decide what level of mastery they were able to independently work at. You have to keep in mind that your assignments and assessments must also be standard-based with this rubric in mind. Design your lessons backwards with the end-goal being level 3 on the scale. Level 3 is what you want the final product to be. Levels 1 and 2 are designed to build toward level 3. You can use this rubric to create activities and assessments that build students toward mastery. Lesson creation and assessment need to work hand-in-hand in order for standard-based grading to be effective. It is also equally important that students take responsibility for their learning and their progress. 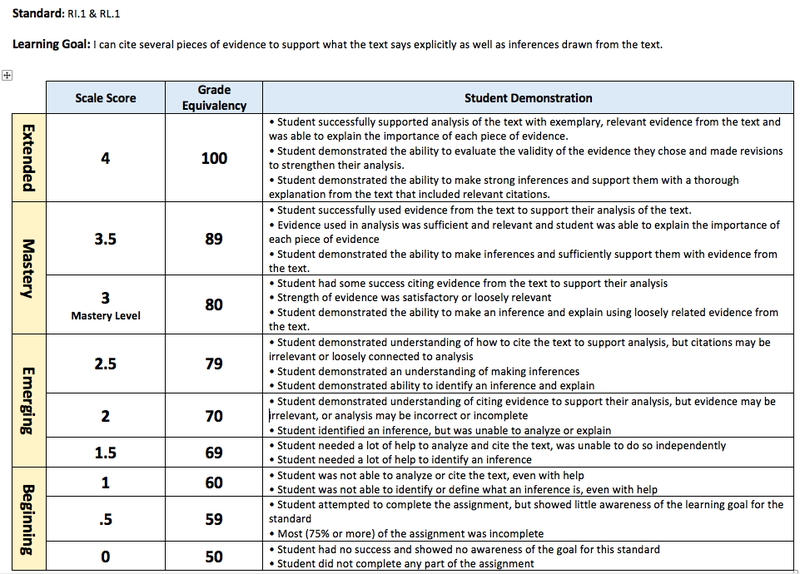 In order to accomplish this, I use student data sheets that reflect the levels on the standard-based rubric. Students keep track of their progress on the standard based on assessment data. This can be formative assessment or summative assessment. The idea is that they are aware of where they are on the scale, they are aware of the rubric, and they can refer to their data to determine what they need in order to achieve mastery. Students keep these sheets in a data section of their binders for constant reference. These are also handy to have for parent-teacher conferences. If you design your grading system around the standards, students will understand why their grade is a B. They will know why they have a C and what standards they need to work on in order to receive an A. Is it difficult to get an A? Absolutely. But it is equally difficult to fail. Students should not be failing unless they just are not trying - and the rubric reflects that. Speaking of failing, I do not give less than a 50. When I was a new teacher, the idea of 50-point grading baffled me. If a student does no work, surely they should receive a 0! But upon further reflection, I realized that there are so many factors that explain why students do not complete assignments, and I wanted my student grades to reflect their knowledge of the standards, not their level of responsibility. Also, once a student falls into a zero-trap, it can be extremely difficult to dig out of. The 10 points between an F and a D is the same as the 10 points between a B and an A. It is only fair. My grades need to accurately reflect what a student can and cannot do. A 50 is low enough to indicate that the student showed no understand of the standard. Most gradebooks these days are online. One thing that I am always sure to do is to indicate what standard belongs with each assignment in my gradebook. It is important for students and parents to know exactly what they are being graded on. This allow them to refer to the rubric in order to determine exactly what they need to do in order to improve. It also keeps parents in the loop on their child's progress on the standards that they will eventually be tested on. If your gradebook allows you to upload files, you can upload a copy of the grading rubric for students and parents to view. 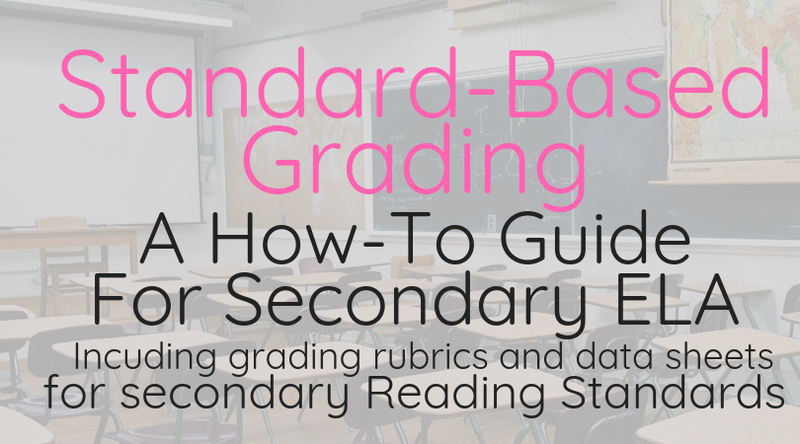 I have created standard-based grading rubrics for all of the secondary reading standards for informational texts and literature. I am making these available for you here on my blog for just $10. 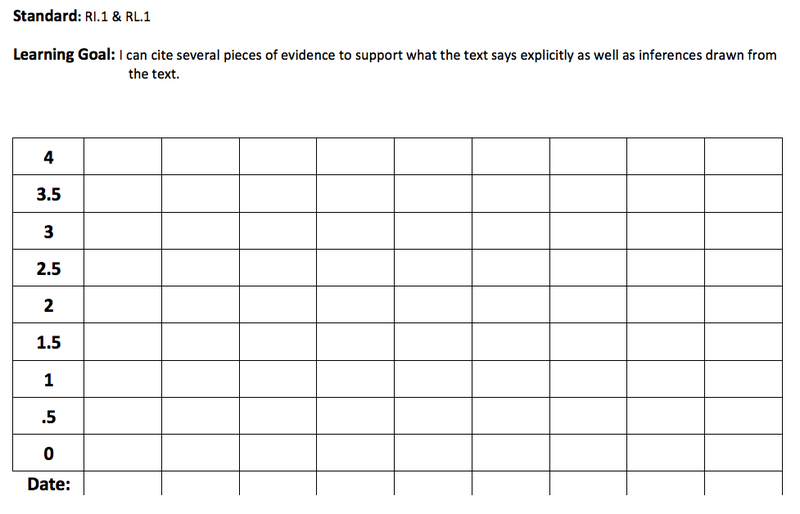 This file also includes a student data-tracking sheet for each standard. 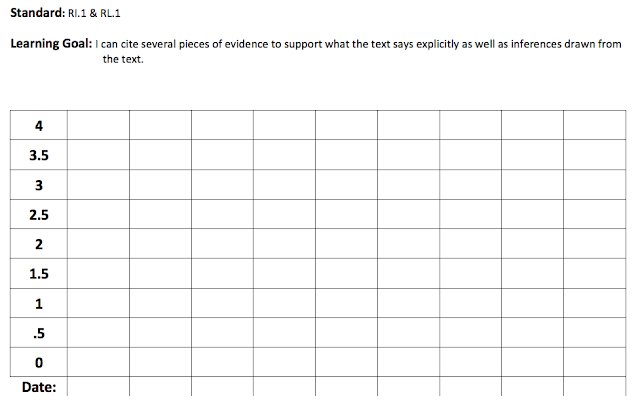 These can be printed, copied, and kept in student data-folders/binders/books. These all look like the one featured above and include the specific targets for each individual standard. If you would like to purchase this document, you can do so trough the PayPal link below. After you purchase, you will be redirected to the download page where you can download the file. If for some reason you are not redirected or you run into some other technical problem, please email me at kailysimpson@gmail.com and I will get the file to you within the day. I usually respond to emails within 12 hours. I love hearing your success stories, please leave them in the comments below! !